With the eggy texture of a crepe, the shape and size of a pancake, and the fluffiness of a popover, a Dutch Baby is a breakfast trifecta. It’s relatively simple to make, can be made using only shelf-stable ingredients, and adds a high-protein twist to the classic flapjack. However, this recipe has a secret: there’s pretty much nothing Dutch about it. So first, a brief history lesson. Victor Manca is credited with developing the “Dutch Baby” recipe in the early 1900s at his cafe in Seattle. While the dish doesn’t look anything like a traditional Dutch pancake or Pannekoeken, it does look a whole lot like a German pancake called an Apfelpfannkuchen, which has been around for centuries. The story goes that when naming his “new” recipe, Victor’s daughter mispronounced Deutsch (German) as Dutch and thus the Dutch moniker was born. 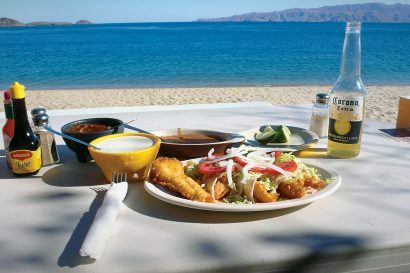 The dish quickly grew in popularity, spreading first across the Pacific Northwest, then across the rest of the nation. Soon, this Deutsch baby was known all over the country as a Dutch Baby. For the camping version of this recipe, we’ve added yet another layer of Dutch convolution: a Dutch oven. While the good people of Holland were actually involved in this one (to the extent that they perfected the method of using dry sand molds for shaping cast iron), it’s widely believed that an Englishman by the name of Abraham Darby was in fact the one to invent the covered metal pot we now refer to as a Dutch oven. 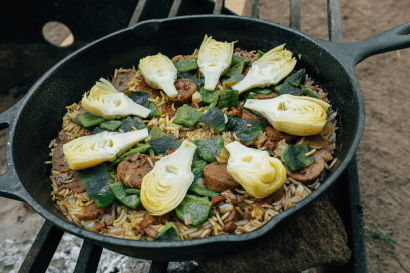 When prepared at home, this recipe can be made inside a regular cast iron pan, but while out in the field, the covered lid of the Dutch oven absolutely essential to the process. So there you go, a German pancake, made inside an English pot, which we for some reason call a Dutch Baby. History is fascinating! Anyways, here’s how you go about making one of the next time you’re at camp. 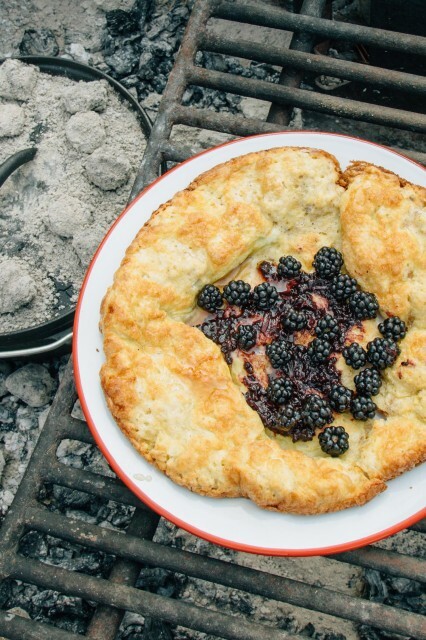 Baking with a Dutch oven while camping can require a bit of precision and finesse. 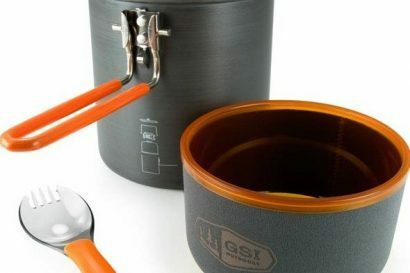 One way to achieve this is to use charcoals instead of wood embers, which allows you to parcel out exactly how much heat you’re using. The general rule for baking is to take the diameter of your Dutch oven (in our case 10”), double it, and that’s how many charcoals you should use. For even heating, one might think to put 10 charcoals on top and 10 on the bottom. However, you loose more heat out of the top than you do out the bottom because the ground helps insulate, so for even heating inside your oven, you take two charcoals from the bottom and place them up top. So we used 8 on the bottom and 12 on top. If you’re using wood embers, then it becomes a bit of a subjective guessing game. How much heat do pine embers put off compared to oak embers? How many embers equal one charcoal? You’ll have to eyeball it each time, but eventually you’ll get the hang of it. 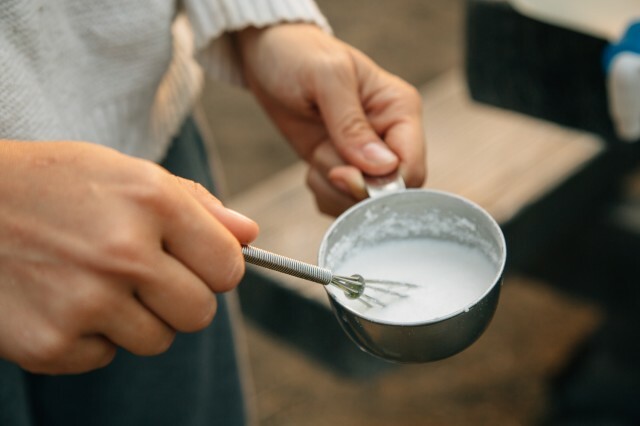 We find that cooler space is tight when camping, so we substitute fresh milk with powdered coconut milk. This recipe will work just as well with fresh milk if available. We also bring along a container of ghee (clarified butter) in place of a stick of butter, because it is shelf stable at room temperature and much easier to travel with. Get your charcoals ready. We used the match-ready version, so all we had to do is pile them together and let them go. If you’re using more stubborn to light charcoals, you may want to make a pyramid onto of some tinder. Get them started and then move on to the next step. 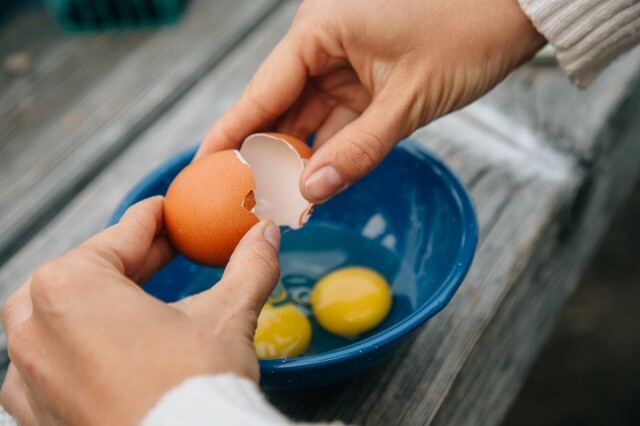 Crack the eggs into a bowl and lightly beat with a fork. Add the milk, stir to combine. Add in the flour, nutmeg, and salt. Stir to incorporate, but do not over mix. 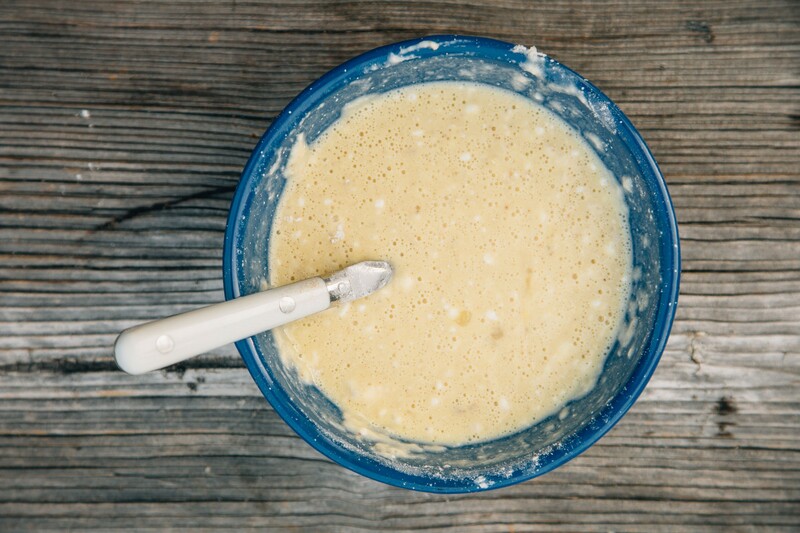 It is ok for the batter to be a little lumpy; over mixed batter will leave you with a dense, chewy pancake, rather than a puffy pancake, which is what we are aiming for. Create a ring with 8 charcoals. 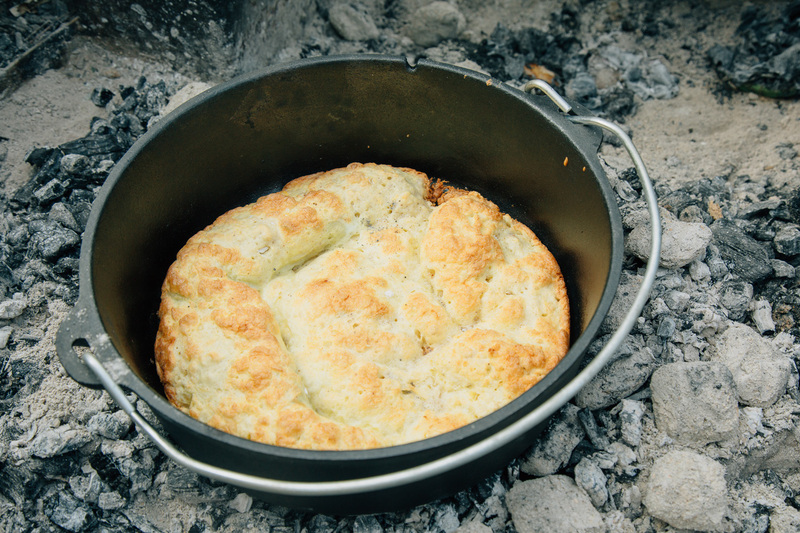 Place your dutch oven on the ring to preheat, making sure that the bottom is level so the batter will settle evenly. Add 3 tablespoons ghee or butter to evenly coat the bottom of the pan. Once the butter has heated, add the batter. 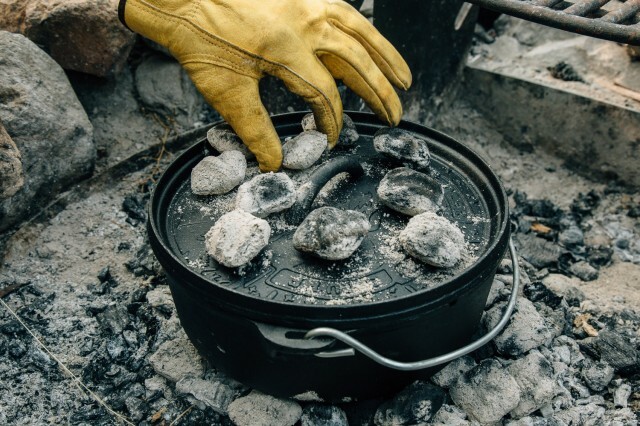 Cover the Dutch oven with the lid, and place the remaining 12 charcoals evenly on the lid. Cook for 20-25 minutes. 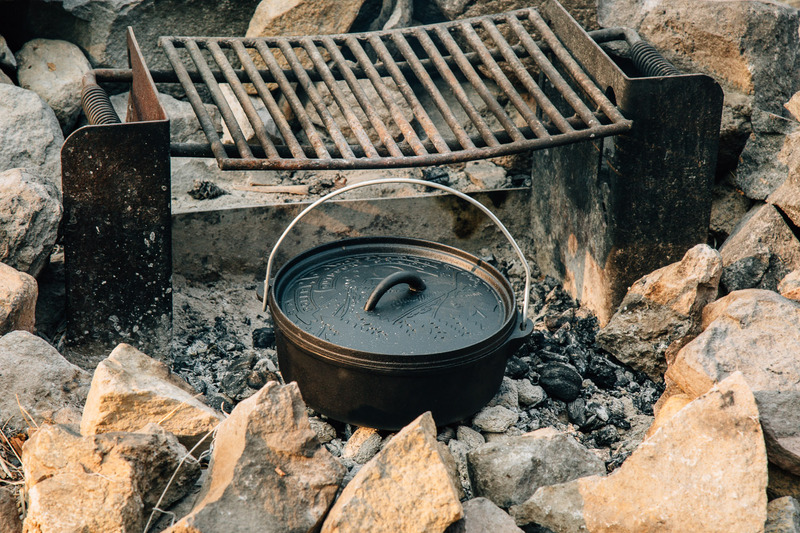 Resist the urge to fuss with the Dutch oven – you don’t want to lose any of the heat inside the oven. At 20 minutes, open the lid a crack to check for doneness – you’re looking for the pancake to be golden brown and crispy along the edges and golden in spots on top. Using a spatula, carefully transfer the Dutch Baby to a plate. 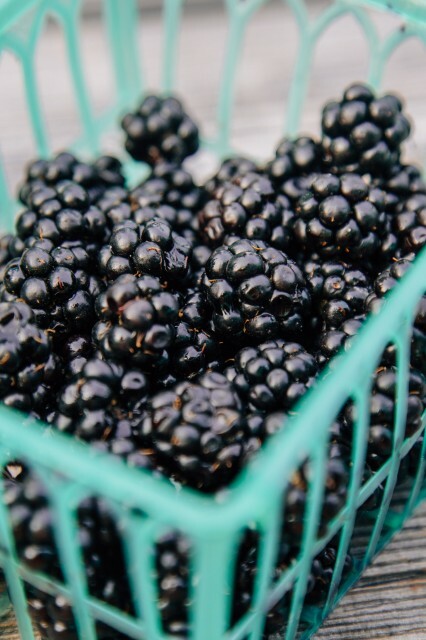 Cut into wedges and top with jam, fresh blackberries, and syrup. 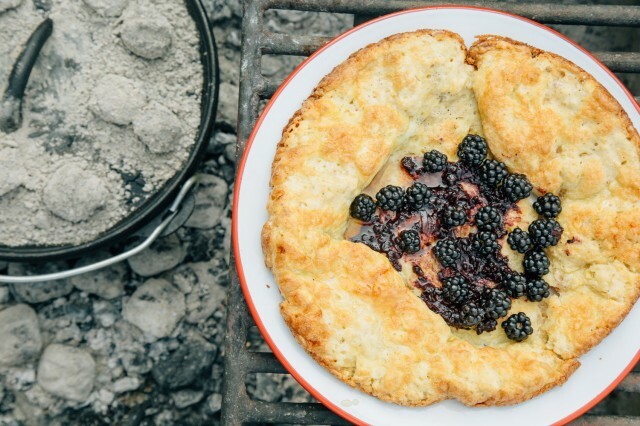 Need menu ideas for your next backcountry meal? Visit freshoffthegrid.com for more amazing recipes.